Given the chance to go back in time to catch a murderer, would you risk it? Even knowing that you couldn’t save the victims? Three years ago on New Year’s Eve, 12 fabulously wealthy members of the Miami Beach jet set were assassinated. The crime scene: a glamorous mansion on Star Island. Mode of death: single bullet wound to the forehead. Suspects: plenty of shifty characters. The lead detective: Lila Day. The killer: still at large. Coincidentally, Dec. 31, 2014, also marked the disappearance of the Janus Society. Devoted to supporting charitable organizations, the Society had always announced the recipient of its annual grant each New Year’s Day. But three years have passed without a word. Before the Star Island Massacre, Lila was the golden child on Miami’s police force, famous for her preternatural ability to sniff out a criminal. The unsolved case, however, has disgraced Lila, who soon finds herself dismissed not only from the police force, but also from her latest job as a security officer for a seamy hotel. 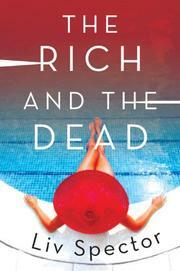 Down and out, she has little to lose when Teddy Hawkins, tech mogul and billionaire, hires her to solve the mystery. First, she has to overcome her doubts about time travel. Teddy sets her up with a meticulously crafted alias as newly divorced socialite Camilla Dayton. He also provides a thoroughly researched dossier on every victim and suspect. Quickly absorbed into the Miami Beach party scene, populated with shady art dealers, former reality show starlets and pushy real estate agents, Lila also finds what she never expected: love with the mysterious Dylan Rhodes. The first in a series professionally packaged by the branding experts behind Gossip Girls, Pretty Little Liars, etc., Spector’s debut establishes an engaging, time-traveling heroine. With more drama than ratiocination, this is a breezy, light detective novel.